To prepare custard pudding, In a large bowl or pitcher, combine cream and milk and set aside. In a medium bowl, whisk together egg, egg yolks and cornstarch and set aside. In a large heavy-bottomed pot over medium-high heat, combine brown sugar, 1/2 cup water and salt. Let sit until edges start to brown, then tilt pot as needed to even the browning until mixture becomes a smoking, dark caramel, about 10 to 12 minutes. Sugar will smell caramelized and nutty and turn a deep brown. Immediately whisk cream mixture carefully into the caramel (the mixture will steam and the sugar will seize). Reduce heat to medium, whisk until caramel is smoothly incorporated into cream and bring mixture to a rapid boil. Add a cupful of caramel at a time to egg mixture, whisking constantly, until half is incorporated. Pour tempered egg mixture back into remaining caramel. Remove from heat and whisk constantly until custard is very thick and cornstarch is cooked out, about 2 minutes. Whisk in butter and rum. Pass custard through a fine mesh strainer to remove any lumps and divide among 10 (6-ounce) ramekins or jars or cups, leaving one-half inch at the top. Cover with plastic wrap, allow to cool and refrigerate until chilled, about 3 hours or up to three days. To prepare caramel sauce, add cream to a medium saucepan over medium heat. Scrape vanilla bean seeds into cream and cook until simmering, about 3 minutes. Add butter and remove from heat. Whisk until butter is melted and incorporated, and set aside. Fill a large bowl (large enough to accommodate a large heavy-bottomed saucepan) with ice water and set aside. In a large heavy-bottomed saucepan over medium-high heat, combine corn syrup and sugar. Add enough water (3 to 4 tablespoons) to make a wet sandy texture and cook, swirling the pan just slightly to gauge the caramelization, until sugar becomes a medium amber color, about 10 minutes. Remove from heat, carefully whisk cream mixture into caramel (be careful — it will steam and bubble). Whisk to combine. Place saucepan in prepared bowl of ice water to cool. Refrigerate, then reheat before serving. To prepare cream topping – In a chilled bowl using a wire whisk, whip cream until it begins to thicken. Add crème fraîche and whip until thick and fluffy. To assemble, warm the caramel sauce over medium heat. 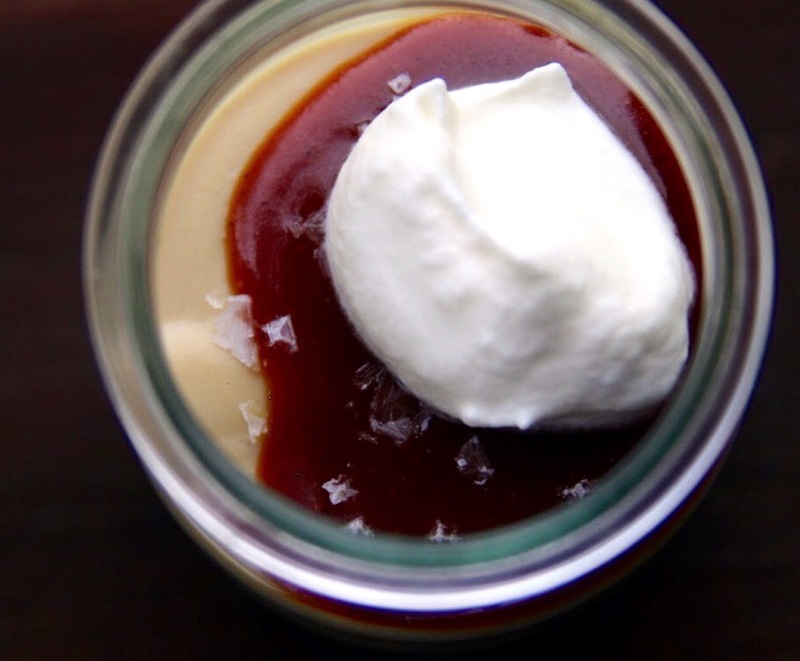 Spoon 1 tablespoon caramel sauce on each pudding, sprinkle with 1/8 teaspoon sea salt, add a dollop of whipped topping and serve.